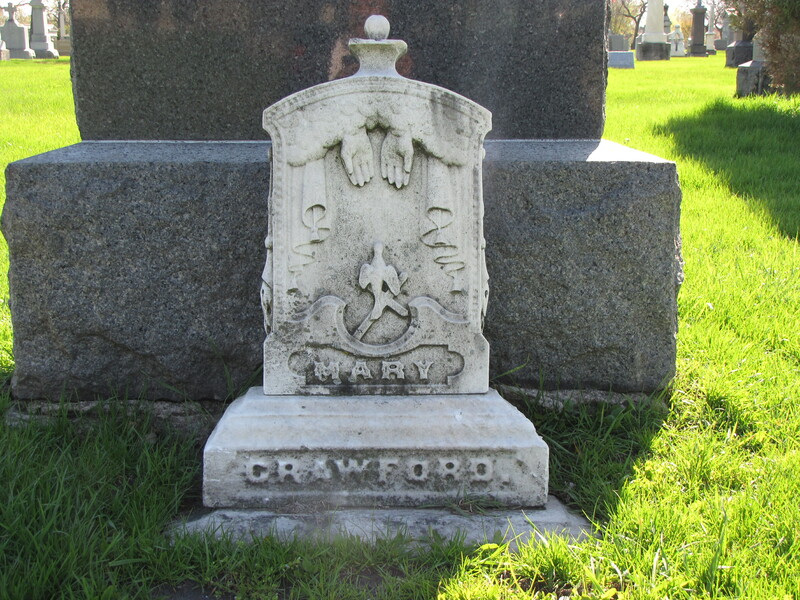 Mary Crawford’s white marble tombstone in the Calvary Cemetery at Chicago, Illinois, is a Victorian mélange of symbolism, typical for the age. The Victorians knew how to do funerals and all things death. The top of the stone depicts swirling clouds with two hands coming downward presumably from the Heavens. Typically, a hand pointed downward on a gravestone represents the hand of God, and symbolizes mortality and death, often sudden death. In this case, the hands look welcoming, almost like they are inviting the soul up to Heaven. The tableau on which the hands are displayed is set like a stage with two curtains drawn to the sides. These often represent funeral drapes, a symbol of mourning and grief. However, they could also represent the veil between one realm and the other—the passage of the soul from the Earthly Realm to the Heavenly realm. At the base of the scene is a dove. Many symbols found on gravestones have multiple meanings. The dove is one of those. Along with the dove symbolizing the Holy Spirit, the dove is also closely associated with peace, often depicted with a sprig of an olive in its beak. This, too, originated in the Bible. After the waters receded in the story of Noah, the dove appears. Genesis 8:11, “And the dove came in to him in the evening; and, lo, in her mouth was an olive leaf pluckt off; so Noah knew that the waters were abated from off the earth.” It was a sign of God’s forgiveness. The dove, with its white color, is also a symbol of purity and innocence and for that reason is often found the tombstones of children. Thus the dove symbolizes the Holy Spirit, peace, and purity. Here the dove sits atop a tilted cross. The cross, of course, is the universal symbol of Christianity. This is very pretty, and is great shape! Nice find!